The Food Allergy Queen: Santa comes from France: Zchocolat! Santa comes from France: Zchocolat! Imagine my surprise and joy when Kim, one of the FAQ's oh-so-thoughtful friends sent a "perishable" Christmas gift. After some wrangling with DHL, who seemed to have problems with diverting the goods from my home to my office for one whole week, I opened this very securely-wrapped box complete with a still-cool gel pack. 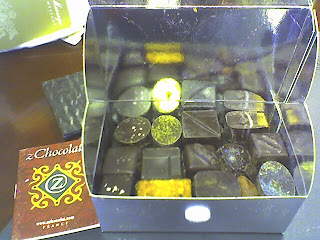 Inside, like a secret treasure, was a beautiful silver foil box shipped from Zchocolat.com, an artisanal chocolatier in FRANCE. It took my breath away. OOoooooh la la! C'est magnifique! Delicieux! Viva la France! After admiring the box in silent reverence for a few moments, I took the time to read the enclosed little booklet about the chocolates and looked at their Website as well. Seems the company was started by an American who moved to Provence and dug up four artisanal chocolatiers in the area to create handmade perfect chocolates. (Making him hands down way cooler than that "A Year in Provence" guy.) 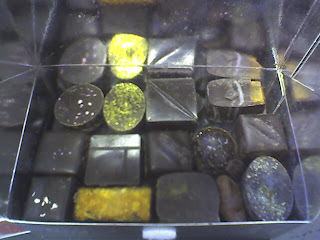 Kim thoughtfully picked an all-dark selection, all of which have been incredible...thinly enrobed rich dark chocolates, ranges of flavors from Earl Grey to raspberry hazelnut topped with gold leaf flakes. Exquisite little bursts of flavor and texture in each one. And so perfect for the Food Allergy Queen. I was so touched and thrilled. The moral to the story? Sharing is good! Keeping a blog has allowed me to share my struggles with my food allergies with the curious as well as those who care about me, but also informs them about the things that I love the most! I mean, hey, Santa brought me chocolate from France ! How could that be bad??? ?